Even presidential pets show the occasional disdain for pomp and protocol. 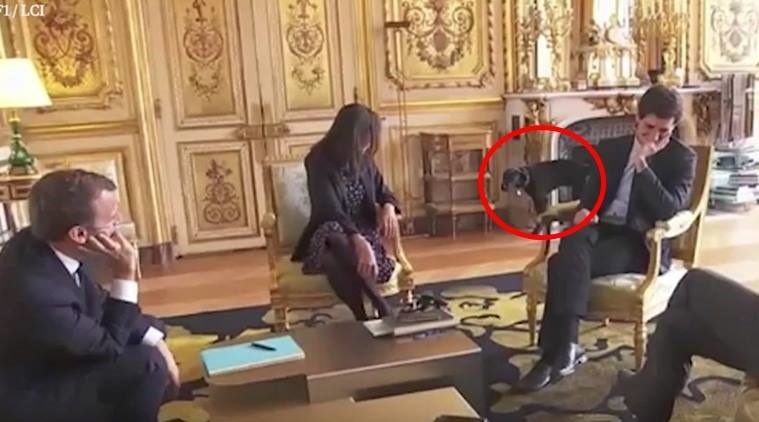 Nemo, the young dog adopted this year by France’s President Emmanuel Macron, was caught on camera relieving himself on a gilded fireplace in the Elysee Palace behind a group of junior ministers meeting with the president. The footage, captured by French TV channel TF1, showed Nemo interrupting the gathering as the sound of him peeing caused those present to turn around before they started giggling. “He’s doing something quite exceptional,” a laughing Macron said. Nemo, a black labrador-griffon cross, was adopted by Macron and his wife Brigitte from a shelter home in August. The footage caused much hilarity on social media sites, where it circulated widely.